I drove West from Virginia 10 days ago, to clear my head and work out the ending of my book. This was a terrific retreat, and the nicest place I’ve stayed so far. The roof construction noise wasn’t too terrible and even though the power was knocked out for most of a day due to the storm, I got a lot of writing done. Only real complaint: The odor from too much furniture polish lingered. Maybe ask the cleaners to lighten up? But it was a great stay. I love Frisco! I got my necklace a couple of days ago. Thanks again!! You guys have been great to work with I appreciate your good customer service! I want to thank RMRM and your employee in unit *** for help during my stay in Copper One during August 2012. First your employee got me into the unit very quickly when I left my door key inside the unit. Second, when I went to find how to get into my unit I left my new cowboy hat in the hall. When I came back it was gone. 2 days later your employee brought a woman to our door with my new cowboy hat & returned it to us.Thank you very much, excellent service. There was a mix-up with the property we reserved. Apparently due to a miss-communication between owners, the property was not ready for us. However, within a short time the management staff had a very acceptable alternative for us, which was clean and ready, and we were able to enjoy our stay as planned at a nearby location. They did a terrific job with a difficult situation. To the staff at the Rocky Mountain Resort, I stayed in Timber Creek condo in January with my sister and friend. We had such a lovely time that I wanted to write and tell you. The location is fantastic and the accommodation was first class. Please pass on our thanks to the owner of the condo. The moose was very cute. It really was a home from home. Thanks also to you all for your friendly prompt reply to any questions we had. If we visit Copper again we would have to stay in the same place and I would happily recommend it. Just wanted to thank you for hooking us up with terrific accommodations at a terrific location. We were seriously in the heart of the Village…it was Great! The family members that joined me were totally blown away. I’m not sure if it was because it was the holidays but our two nights at Copper were magical. Thanks again and I will not hesitate to refer anyone to you. Happy New Year! Thanks so much for renting us the condo in The Springs at Keystone…. Just wanted to let ya’ll know how impressed we were with the excellent response when we had problems with the heating system. Normally it’s difficult to contact any resort managers on a Sunday night. Not only were you easy to get in touch with, but you were at the condo within 20-30 minutes after we first contacted you. We really appreciated the fact that both of you were available and doing everything possible to ensure we had heat and were comfortable Sunday night and didn’t try to put off repairs until Monday. Our entire family would highly recommend your management company and the excellent services you provided. Thanks again for making our vacation a pleasure. 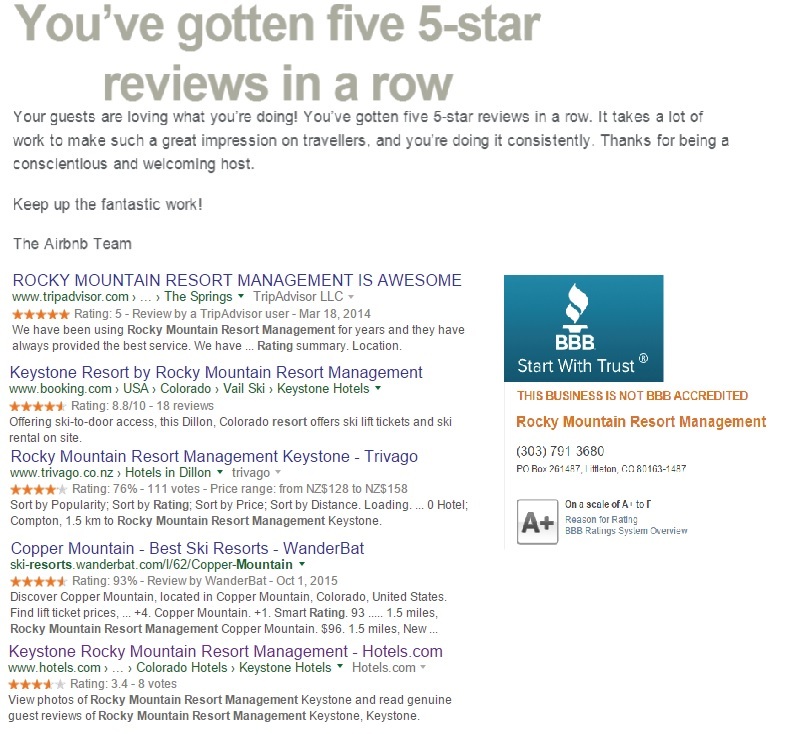 I also wanted to mention that no matter what great reviews to your supervisor and TripAdvisor.com are on me. You truly were the best out of all other agencies I talked with and you were the reason I decided to go with your company yesterday and did all the paperwork as quick as possible. My current opportunity came up unexpectedly and was not part of my options even when we started working together. Thanks for your help again and I look forward to doing business with your company next year. Hey Ya’ll I WAS THERE and it was AWESOME on friday the 2nd !!!! I was on the mountain most of the day ( until about three o’ clock ) then of course on my last run of the day I ATE IT BIG TIME and tore my ACL !!!! Got a courtesy ride down American Flyer VIA ski patrol went to the clinic and the whole kit and Kaboodle. Stayed in Summitt House for the next TWO days and watched it snow and saw CU AND LSU get there asses handed to them . Property 506 was AWESOME could’nt have spent time with a torn acl at a better place. I am going to the Doctor on Mon the 12th for an MRI and then will schedule surgery on it !!! Will keep ya’ll posted as we still intend on coming up in Feb. Although I will be limited to the Bars only… Trying to keep a happy face. Thanks, this has been an excellent rental and I will consider contacting you for future summer rentals. Thank you so much, you have been so helpful throughout the entire process! Thanks again. Thank you for your prompt service. Everything went very well, I will certainly try to do business with you in the future. I stayed at your Silver Mill rental last week (SMAE). Another couple stayed at Buffalo Lodge. I wanted to say thanks for renting the properties to us. They were great. The location was great, and we really liked the fresh snow you arranged for us each morning…. thanks. Thanks so much for the quick response! We are looking forward to our visit. It will be our 7 year olds first trip – ski school the first day for sure! and our 15 year olds first trip since he was 6 – he wants to try snowboarding this year. If you know of discounts on ski school, let us know as they will both be going the first day. We haven’t been out since 2001 and can’t wait! My husband and I appreciate your personal response and the way you make the arrangements – we have typically had to stop in Frisco to pick up our keys. We can’t wait!